Simon and Shuster, New York., 1977. 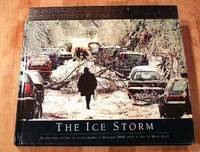 First Edition (Shown But Not Stated).. Hardcover.. 9 3/8 H x 6 1/4 W x 1 3/4 thick.. NON SMOKING STORE. 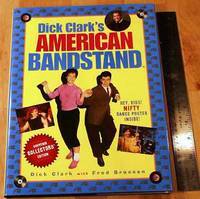 My listing INCLUDES PHOTO OF ACTUAL BOOK for sale. Book Interior FINE / Boards Fine / Dust Jacket Near Fine. Book feels Never read or very gently read once. Sewn binding. Rag edge pages. Spine is straight, square, solid, has a miniscule bit of edge wear on bottom of spine, none on top, has short horizontal crease at top free end and a few short vertical creases on bottom free end of spine. Dust jacket is white, lettering black/blue, cover painting and design 1977 by Wendell Minor, black/white photo on back. Dust jacket is NOT PRICE CLIPPED, has a bit of age darkening on edges and folds of flaps and on some of the white spine and back, small amount of shelf wear and soil on back, some small creases and edge wear on top and bottom of dj spine and a 3/8 inch rip, one short crease on front of dj at left upper corner, minor edge wear. Book boards and spine are flat, clean, bright, no rips, no bent corners, no spine creases, no sunning, very small amount of edge wear. Page edges very slightly sunned. Inner end papers are tan. Pages are sagging very slightly while book was upright for so long. Inside of book is tight, clean, bright, clear, flat. No dog ears that I saw. Owner’s name, date, small, in ink on ffep. Two detailed maps and more than 80 photographs. Preface. Acknowledgements. Notes. Sources. Index. 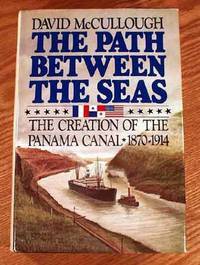 Title: The Path Between The Seas: The Creation Of The Panama Canal 1870 - 1914. Publisher: Simon and Shuster, New York. Size: 9 3/8 H x 6 1/4 W x 1 3/4 thick. 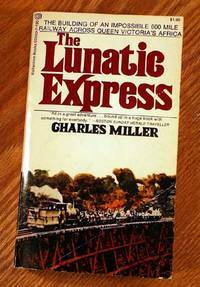 The Lunatic Express: An Entertainment In Imperialism. Pax Britannica (Trilogy 3 Volumes in Collector Slipcase Box).